Win a $50 Gift Certificate to Mastro’s Steakhouse! Congratulations to Brien Lyons on winning our 100th High Five Giveaway! Thanks to all who entered. 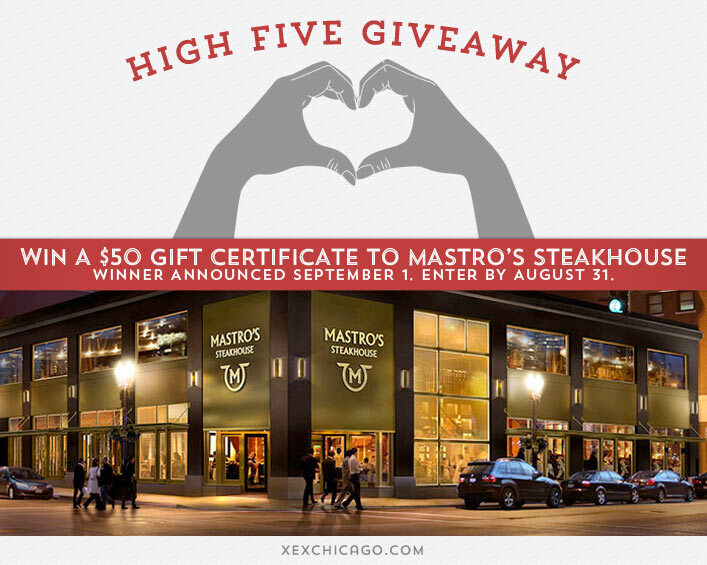 For our next High Five Giveaway we have a $50 gift certificate to Mastro’s Steakhouse. Mastro’s is located at 520 North Dearborn Street, Chicago. Visit their website at www.mastrosrestaurants.com/chicago or call them at 312-521-5100 for more information. How many boards does XEX’s Pinterest profile currently have? Now, just add a comment to this post with the right answer to be eligible to win! The winner will be announced on Monday, September 1. Enter by midnight on Sunday, August 31!